Updated “bottom fishing” prices for semiconductor ETFs. 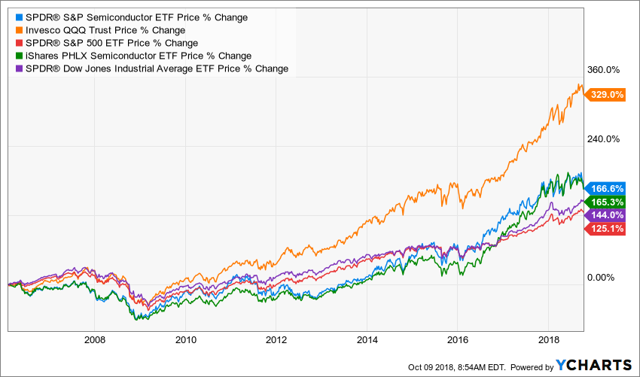 Semiconductor ETFs have been market leaders over most time frames, however, have significant bear markets once or twice per decade. I believe there will be a shallow bear market in semiconductor ETFs. Look for a chance to buy the SPDR® S&P Semiconductor ETF (XSD). I updated the bottom fishing prices for semiconductor ETFs today. These have been market leaders for an extended period and should be a part of any tactical portfolio that makes occasional asset allocation shifts. Since before the financial crisis, the PowerShares QQQ (QQQ) has been the index to buy and hold. However, as an industry, semiconductors, which make up a significant percentage of QQQ have beaten both the S&P 500 (SPY) (VOO) and Dow Jones (DIA). 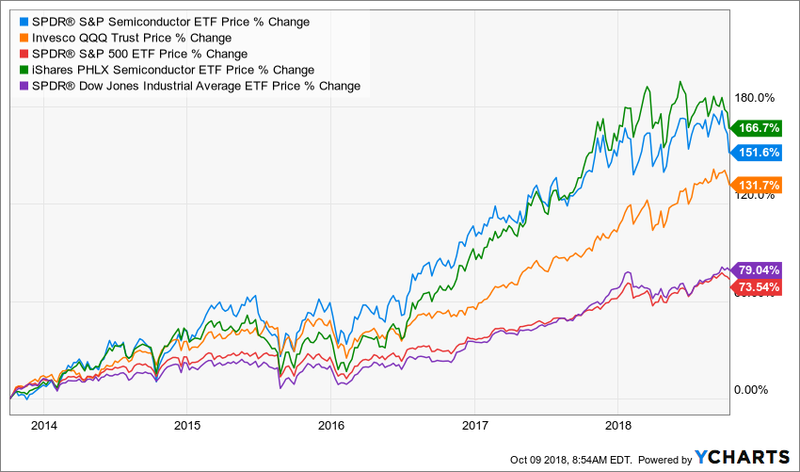 Here to facilitate a longer comparison period, I represent semiconductors with the SPDR® S&P Semiconductor ETF (XSD) and the iShares PHLX Semiconductor ETF (SOXX). We should be looking for a significant retracement and a buying opportunity. I prefer the SPDR semiconductor ETF because its holdings include solar components, such as, First Solar (FSLR) and SunPower (SPWR). If you have an equity portfolio with significant solar stock holdings, then the iShares fund might be for you to avoid inadvertently overweighting your asset allocation too much to solar. Keep in mind, long-term, I think we can get to nearly 25% solar exposure, however, I don’t think we get there until we have sold more of our oil holdings. Remember, we are looking for a reversal of the downtrend, so we might not get all the way to the bottom fishing price. That said, I think we at least get close.